Chiang Mai is now one of the best cities to visit in Thailand for both golf and culture. There are now over 9 championship courses in the area to ensure balanced golf variety, scenic beauty, and challenge. In addition, the Northern Lanna, people of Chiang Mai love celebrations and holidays and Chiang Mai has more occasions to celebrate than all other destinations. If you are quick, you can catch the International Horticulture Exposition. This is scheduled from November 2006 through January 2007 at the Royal Agricultural Research Center, Chiang Mai. The expo, also known as Royal Flora: Ratchaphruek 2006, will celebrate His Majesty the King’s Diamond Jubilee of His Accession to the Throne and His Majesty’s 80th Birthday anniversary in 2007. The exhibition is divided into 14 weeks with different themes. There is great golfing in Chiang Mai, some notable courses being Chiang Mai Green Valley Country Club, Chiang Mai Highlands Golf and Spa, Chiang Mai Lamphun Golf Club, Gassan Khutan Golf and Resort, Gassan Lake City Golf and Resort, Mae Joe Golf Club, and Royal Chiang Mai Golf Resort, and the newest course just opened this month, Gassan Marina Golf and Resort. Chiang Mai also hosts the Bosang Umbrella Fair during January, featuring colourful paper umbrellas and other local handicrafts, and the Flower Carnival during February with parades and colourful floats exhibiting the local flora. The Chinese Lunar New Year is celebrated all over Thailand on the1st day of the first Chinese Lunar month, usually in February. The date of Makha Bucha Day at the end of February/beginning of March also depends on the moon. This commemorates the day when 1,250 of Buddha’s disciples gathered spontaneously to hear him preach. Buddhists visit Wats and make merit by such acts as releasing caged birds. In the evening the celebrations culminate in a candle lit procession around the main temple building. While in Northern Thailand, why not take in the Elephant Banquet, also in February at the northern province of Lampang, easily reachable from Chiang Mai in a few hours by car. The folks there put on a feast for elephants. The world’s largest kantoke tables — a round table usually less than three feet across — are piled high with flowers, bananas, sugar cane and other elephant favourites, then the big beasts go at it. While attending the festival you may want to give Mae Moh Golf course in Lampang a try. This 6374-yard, par 72 golf course is located adjacent to the famous clay mines there with an impressive mountain backdrop, stunning beyond words! Without a doubt, the biggest party of the year is the annual Songkran Festival, celebrated, 13-15th April The festival traditionally celebrates the end of the dry season, and has always involved water. Thai’s sprinkle water on Buddha images, and on the hands of monks at temples, as an offering to express confidence that the supply of water will be adequate to cover the dry season. Songkhran is also the time when the Thai family will try to be together, and many people will travel back to their home village. These days the gentle Buddhist ceremony has now become secularized, with exuberant merrymakers taking to the streets throwing water at each other, and you, by the cup full, the bucket full, or even with a hose. Watch out for your caddie if you are golfing on these days, she will probably take the opportunity to dowse you with ice cold water. To add to the fun, talc is mixed with the water and may be daubed on your face. Take it all in good spirit, no one is exempt, not even the policemen. The cool water may even be a welcome relief as the festival coincides with the time when the sun is due overhead and the weather can be very hot. Songkhran is celebrated all over Thailand , with Chiang Mai being where the celebrations are most traditional. Possibly Thailand’s strangest festival takes place in June. Phee Ta Khon might best be described as a sort of Halloween, only its adult men who dress up and not children. The costumes are meant to scare away ghosts who may be about and are sometimes a bit risque. The exact date of the festival is decided by a local shaman and may only be determined a few weeks before. June is a good month to head north and escape the hot weather. 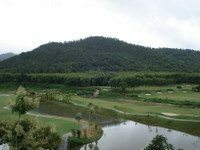 Why not combine a trip up North to Chiang Mai with a visit to Chiang Rai where there are two outstanding golf courses, Santiburi Country Club and Waterford Valley Golf Club. If you have attended any of these festivals please feel free to share your comments here or if you prefer to get more information, please feel free to contact me at my Thailand golf vacation company.